The Chronicles of Narnia was one of the first series I remember being recommended to me. My generous uncle gave me all seven books in that series at once when I was in elementary school. As soon as I read The Lion, The Witch, and the Wardrobe, I began quietly touching the back of every closet to see if it contained a wall behind the clothing hanging in there or if it would somehow lead me somewhere interesting. I was a little young for the later, darker instalments at the time, but I loved the first few stories immediately and soon grew up enough to enjoy the rest, too. One of the things I loved the most about the magic in that world was how unpredictable it was. Aslan didn’t always show up when you expected him to, and he didn’t necessarily meet my expectations of what the creator of a planet would be like either. I spent more time than I care to admit memorizing little details about Narnia and wondering what it would be like to go there for real. When my uncle heard how much I adored his gift, he came up with something even better for the next round of gift-giving: copies of The Hobbit and the Lord of the Rings trilogy. The Hobbit was an instant hit with me. I loved Bilbo’s cautious nature and the exciting details of his trek to The Lonely Mountain. It was one of my first brushes with characters who were in real danger when they went on an adventure. This was a more treacherous world than the one the Pevensie children knew. There were no adults around to save them, and I was never entirely certain if Bilbo or his companions would make it home safely again. Not only were there carnivorous trolls in The Hobbit, Bilbo also had to face conniving Gollum (whose backstory and identity wasn’t revealed until The Fellowship of the Ring), gigantic spiders who also wanted to eat him, and many other perils. My uncle knew what he was doing when he recommended these stories to me. The basic rules of magic were different in each universe because one was written for a younger audience than the other was, but they were both filled with creatures whose very existence tickled my imagination. Suggesting the right book for someone is kind of like giving them clothing. Knowing the right size (or genre, in this case) will go a long way in helping you pick something out, but there are many other small details that matter as well. You have to know someone incredibly well in order to have any chance at all of giving them something they’ll want to use or read over and over again. There have been times when I’ve recommended books to people who ended up not enjoying those tales at all. In other cases, I’ve had books recommended to me that didn’t quite fit my tastes. Other than obvious errors like writing two-dimensional characters or using cliches excessively, so much of what goes into a great story is subjective. 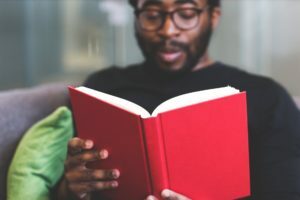 You might be bored stiff by plot lines that I love, and I might feel the same way about the stories that someone else could spend all day reading without ever growing tired of them. 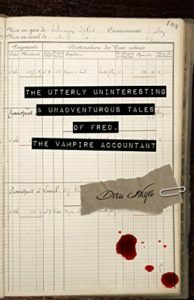 So it came as a huge surprise to me when a friend recently recommended a book that I’m loving so far: The Utterly Uninteresting and Unadventurous Tales of Fred, the Vampire Accountant by Drew Hayes. Fred was a completely ordinary man who was turned into a vampire as an adult. He gained strength and became a physically healthier version of himself, but he otherwise remained the same shy and quiet man he’d always been. No, he didn’t sparkle in the sunlight, seduce teenage girls, radically change his habits, or suddenly have the nearly-supernatural ability to conquer the world. (There’s nothing wrong with liking any of these tropes, of course, but they’re not the kind of storylines I generally want to read about). Honestly, other than the fact that he drank blood and was now allergic to daylight, Fred reminded me of myself and of a few of my friends. He had a kind soul and a sharp wit. Sometimes he worried more than he should. He wasn’t the life of the party, although he was incredibly likeable and charming once you got to know him beyond his day job and strange affliction. This is the kind of vampire fiction I will never get enough of. It has a dry sense of humour and a realistic take on what it might be like to become a vampire but still have nearly all of the problems from your old life following you around. Will you like this story? I don’t know. There are some readers who I’m sure will stop a few pages in once they realize that Fred is breaking nearly all of the rules that have ever been made about what a vampire is supposed to be like. It’s completely okay for them to do that, and I hope they find what they’re looking for elsewhere. When I recommend this tale to people in the future, I’m going to save it for folks who enjoy unconventional monsters, sarcasm, and the realization that becoming a vampire isn’t always all it’s cracked up to be. There’s an audience out there for every book and a book that’s perfect for even the most selective reader if you look long enough for them.